Team Meat posted the twelfth “Caturday” Mew-Genics teaser yesterday, revealing that their mysterious game will allow you to enter “Frank’s Cat Races”, where you and your fastest feline have the chance to win cash prizes or “magical poopies” down in the sewer. This latest tease does little to reveal exactly what the developer’s upcoming game is actually about, however, it does add just enough pieces to the puzzle to give us some idea as to what we will be doing with all those cats. From the start, it has been pretty clear that Mew-Genics will involve breeding (or possibly genetically engineering) cats with various unique physical attributes like horns, extra legs, or forked tails. 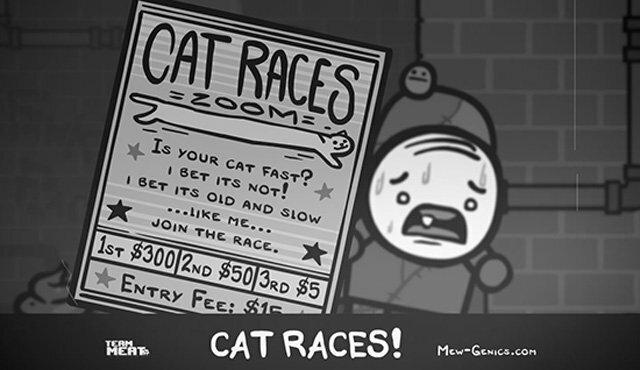 Once you have created one of the over twelve sextillion possible cats in the game it appears that you can then either freeze them for later use, or enter them into one of the game’s several competitions — like Mr. Tinkles Boon County Cat Pageant or Frank’s Cat Races. Additionally, it is starting to look like most (if not all) of the five characters that were originally announced for the game will not actually be playable but instead serve as hosts for these different activities. Aside from the Cat Pageant and Races, Team Meat has also hinted that there will be some kind of combat competition between the cats in the game (remember the “Petrified Poop” that granted your cat the ability to reduce “damage taken”). Butch seems like the likely choice to head up such an activity — given his “shady” nature and multiple “scratches” — but that is just a bit of speculation on our part. We are still waiting to hear exactly how all of these different aspects in Mew-Genics will fit together, but it’s nice to finally be at a point where some of the craziness is starting to make sense — or perhaps we have just gone insane trying to figure it all out. Either way, Team Meat should have another update for us next weekend. Once they reveal the next tidbit of news we will let you know.